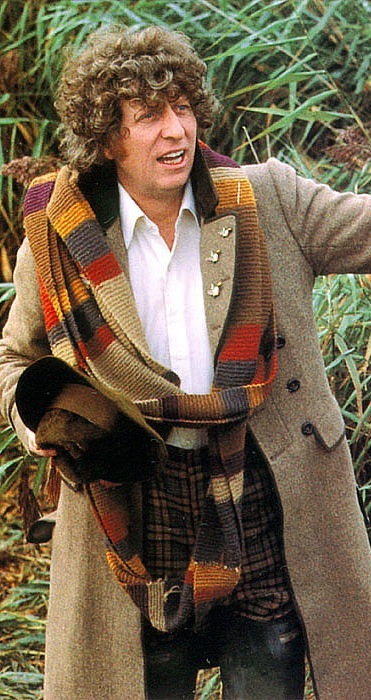 This week my Fourth Doctor costume index reaches season sixteen, the fifth year Tom Baker was in the role. Last season the serials were run drastically out of recording sequence. This year, aside from the first two adventures, all serials were shot in their broadcast order. Costume-wise things really settled down with this season, with only some variation coming in towards the end. The extra wide scarf knitted in off-colours was ditched to be replaced by the two previous scarves crudely joined together to create a single one of monster length, along with the flamboyant cuff boots it makes the costume an exaggerated caricature of itself. Picking up from the season fifteen’s finale, The Doctor continues to wear the chestnut brown velvet frock coat; Charcoal waistcoat with floral motif design, worn unbuttoned; white cravat; and knee-high cuff boots. These are now rounded off with the regular ivory dress shirt, worn in last season’s Image of the Fendahl and Underworld. The biggest difference to his ensemble is the introduction of a new variation of the scarf. This is made from the remains of his original scarf from season 12 and the duplicate created for the android Doctor in The Android Invasion. The two scarves are crudely sewn end-to-end, making it the longest scarf yet. 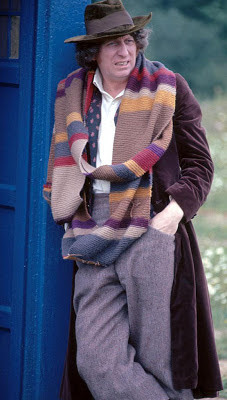 He continues to wear this scarf throughout Seasons 16 and 17. His hat doesn’t make an appearance in this serial. Worn with the boots are the wide legged Donegal tweed trousers which first appeared in The Face Of Evil. These now look to be cut short to overlap the boots, but not tuck in (see below, right). They are very high waisted and held up with the brightly decorated button braces. 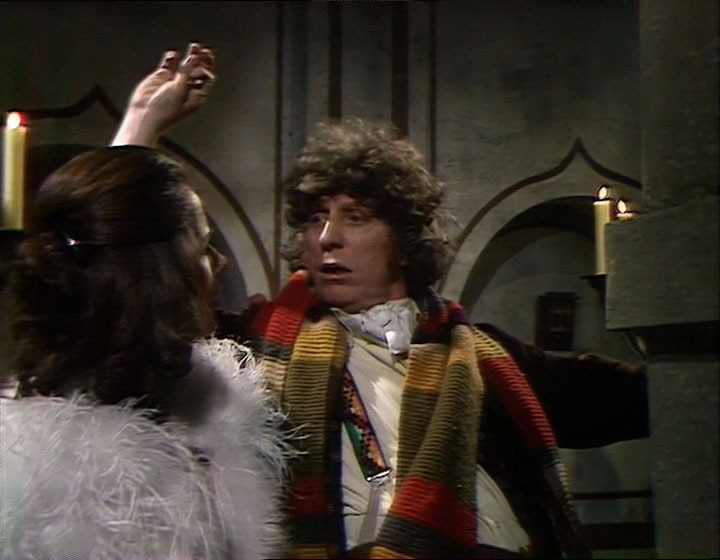 At one point we get a good look at the interesting braces (glimpsed all too briefly in The Invasion of Time). They have a green and red zig-zag embroidery pattern (see right). In Episode four he wears armour to impersonate a Levithian Invincible. The Doctor’s entire costume remains unchanged from The Ribos Operation. 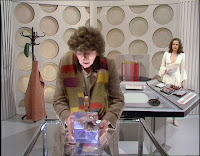 The serial opens without the scarf, which he soon collects from the console room hatstand before leaving the TARDIS. 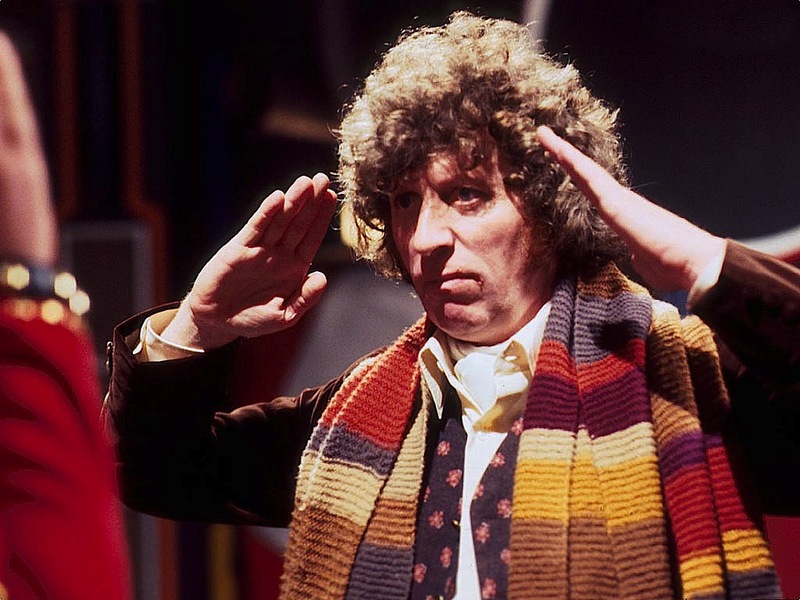 He also picks up the bottle green fur felt fedora, but aside from wearing it for all of five seconds when he leaves the TARDIS, this goes straight in his pocket and is not worn again. 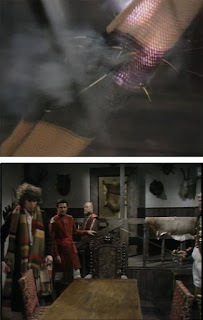 Also on the hatstand are his Android Invasion tweed coat (see left, second picture); two canes - one bamboo, the other with a blue candy strip (see below); and an unidentified dark coat which maybe the burgundy velvet frock coat not seen since The Deadly Assassin. He appears to be wearing two different shirts in this serial. For most of the studio scenes he wears the ivory shirt (see below, top left), but for the location filming and in a few studio scenes he wears a lighter ecru version with single cuffs held together with cufflinks (see below, top right). A good way to spot the two shirts is to look at the visible contrast between them and the cravat (when worn). Dropping his white cravat, The Doctor continues to wear the same basic outfit from The Ribos Operation. This consists of the chestnut brown velvet frock coat; Charcoal waistcoat with flora motif design; ivory dress shirt worn open collared; Beige wide-legged Donegal tweed trousers; brown cuff boots; and the ever present double-length striped scarf. 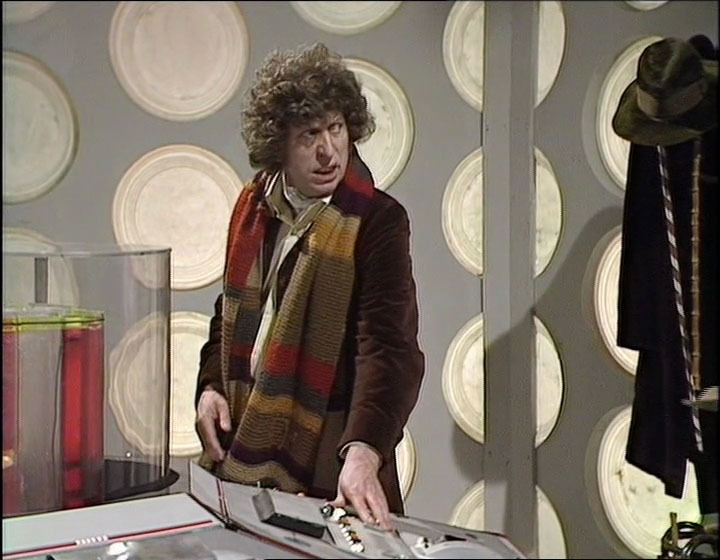 In the TARDIS the console room hat stand is bare of coats, and his bottle green fedora spends the first episode being worn by the TARDIS time-rotor (see left, top). Even when The Doctor picks it up in episode two he immediately puts it in his coat pocket, where it stays for all but a brief scene in the last episode. Leaving the TARDIS in episode one The Doctor suddenly has a golf umbrella which he holds for barely one scene (see left, third picture). For a large part of episode four he wears a white barrister’s wig and holds some professional looking papers while playing lawyer opposite the Justice Machines (see left, bottom). 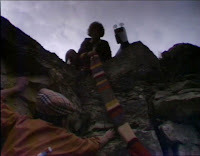 The opening of episode two sees the scarf comes into play when The Doctor uses it to rescue Romana from the literal cliffhanger at the end of the previous episode (see right). The frock coat is now starting to look a little tatty in places. If you look closely the wasitline pocket flap is a coming adrift at the back (see left). The serial opens with The Doctor pursuing a number of leisure activites. 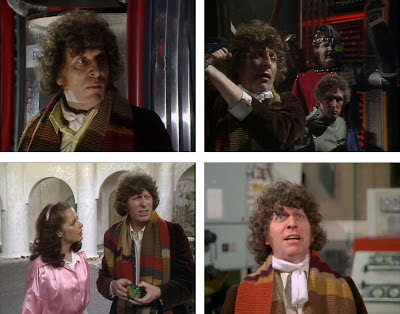 This serial is the last of six (26 episodes) forming an unbroken run wearing the chestnut brown velvet frock coat. The rest of the costume is principally the same as it has been all season: Charcoal waistcoat with floral-motif design, worn unbuttoned; Beige wide-legged Donegal tweed trousers held up with button braces; brown leather cuff boots; and double-length striped scarf. This time he does wear the bottle green fur felt fedora, which like its brown predecessor is now getting a distinct crease in the brim from where it has been towed in his coat pocket. At one point in Episode one, a character appears to burn off the end of the Doctor’s scarf! But don’t worry, if you look closely, you can see that the supposedly severed end of the scarf that the Doctor is cradling is, in fact, still fully intact. 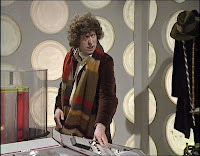 This serial debuts an principally new outfit, featuring a light brown Harris Tweed frock coat, returning to the four pocket arrangement seen on the previous Beige tweed which first appeared in The Android Invasion (the two velvet frock coat only had two outer pockets). The new coat has large lapels with rounded corners, piped with dark brown trim; a large dark brown velvet collar, worn turned up around his neck; further dark brown piping around the collar, pocket flaps and a few inches up from the cuffs. The design is curious, as although it appears to be a double breasted front, the coat isn’t full enough to actually overlap. For this serial only the lapels are decorated with china flying duck brooches - one large on his righthand side and three in graduated sizing up his lefthand lapel. 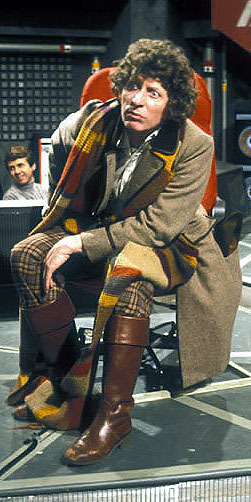 The Doctor also has a new pair of trousers, held up with grey buttoned braces. They look to be made from “weathered” Blackwatch tartan (though I can’t confirm this at the moment). Although you would be forgiven for not knowing, he’s also wearing a new waistcoat. Worn unbuttoned, it remains hidden under the coat for the vast majority of the serial, only peeking out on a couple of occasions. More will be seen if this in the final adventure of the season. Finally (and unique to this serial) The Doctor wears thigh-high green fisherman’s waders. In a few scenes the top halves are folded down to make them a below-knee length. They have an unusual striped interior (see below, right). The remainder of his costume is carried over from previous with the ivory dress shirt, worn open collared without tie or cravat; the bottle-green fur felt fedora; and of course the double-length season 16 & 17 scarf, however he now wears it in a large loop under the raised collar and lapels of his coat. 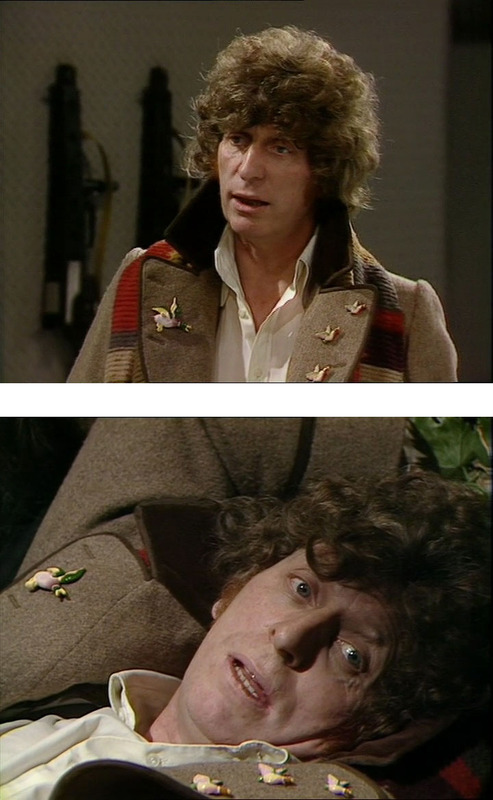 The Doctor’s change of costume for the previous serial is carried over to the season finale. He wears the new light brown Harris tweed frock coat; weathered Blackwatch tartan trousers; off-white dress shirt, worn open-collared; carries his bottle green fur felt fedora; brown leather cuff boots; and the season 16 & 17 double-length scarf. He also wears the new waistcoat which debuted in The Power Of Kroll, but was largely unseen. 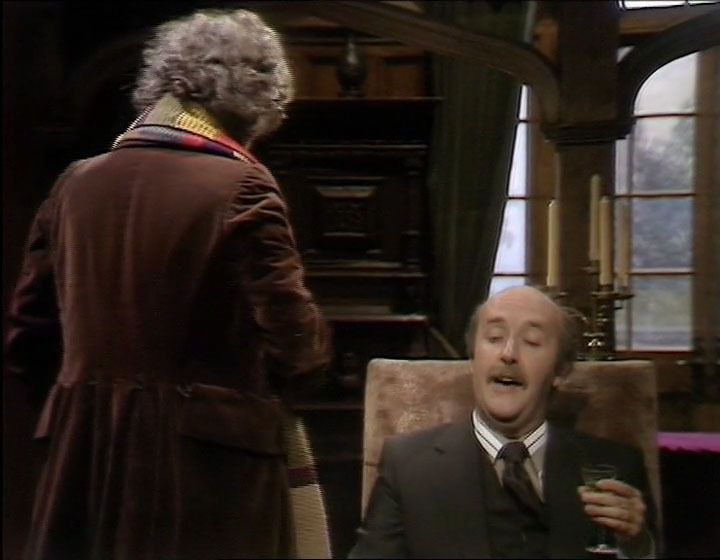 For one scene The Doctor is without his coat so we can see that is is a fancy brown, green and gold tapestry fabric in a paisley design. At the start of the serial the console room hatstand is seen to have the Talons Of Weng Chiang inverness cape; and the bold Prince of Wales checked velvet waistcoat. Lurking underneath looks to be a velvet frock coat, but it is difficult to tell for sure. 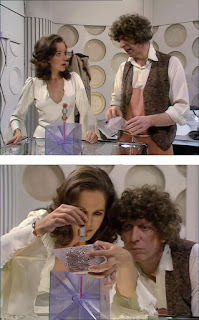 By episode four they are replace by the pink rubber apron! A good shot of the original end of the scarf shows the unfortunate condition of the tassels by this point, compared to how they were at the beginning of the season. Notice too that he appears to be carrying BOTH his hats stacked together in the same pocket! Congratulations on compiling this invaluable guide!! I've been waiting for you to get to Season 16/17 as its my favourite look (culminating with Destiny Of The Daleks) and appreciate all the attention to detail over the various stories. I'm curious about the scarves though, wondering what the fate of the Season 15 version was (lost/stolen/retired? )and just how long the 'monster length' one was in the end as with Tom being around 6'3" it must've been stretched way beyond 20 ft. to reach to his knees. Also, one can take the word of the Prime Computer. I believe my final measurement wasn't far off theirs. Lol, finally somebody who takes this stuff as crazy serious as me. Fabulous presentation and The Prime Computer no less. maybe it was as good as they were making out after all. I concur - mystery solved - My thanks to you! !